Shortly thereafter, the new coat of arms begin appearing in use. Early New Jersey copper coins, for example, show the horse's head crest, and the full arms appear on paper currency issued in 1781 (examples shown at www.coins.nd.edu/ColCurrency/CurrencyText/NJ-01-09-81.html). The specific details of colors, attitudes of the supporters, etc., varied according to the taste of the artist, as is encouraged by heraldic tradition. Among other things, given the original law's lack of specificity with regard to tinctures, the arms were often shown with a white field in the early years; later blue became the most usual choice and the invariable one shortly after 1900. The current detailed blazon was enacted to preclude all further variations in the artistic treatment of the arms, and the artist Warren E. Deming was hired to draw a permanent authoritative depiction. New Jersey infantry regiments of the Civil War period carried two colors. One resembled the Stars and Stripes but with the New Jersey arms on the center of the canton surrounded by the stars. The other, the regimental color, was blue with the state coat of arms on the center. Cavalry regiments carried only a standard, the same basic design as the infantry regimental color but smaller. Most of these colors and standards had the arms displayed on a light blue disk with the regimental designation on a red scroll beneath it. For example, see the flag of the 2nd New Jersey (probably Cavalry) at www.nj.gov/military/museum/civil_war/CWF011lrg.jpg. 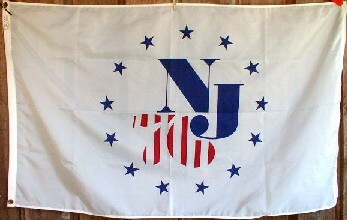 Around the turn of the 20th century, regiments of the New Jersey National Guard carried dark blue flags with the arms embroidered directly on the field, such as that of the 4th Regiment, N.J.N.G., at www.nj.gov/military/museum/civil_war/CWF024lrg.jpg. The home page for the state military flag collection at the New Jersey National Guard Militia Museum is www.nj.gov/military/museum/civil_war/. 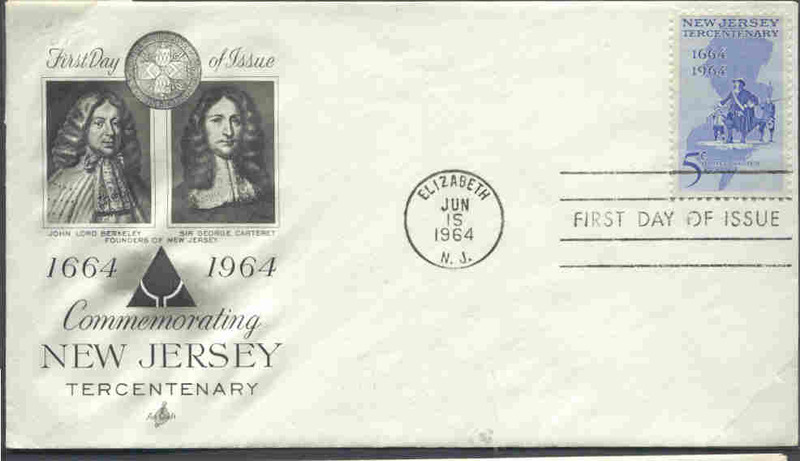 Offered by "edwinart" on eBay was a "Tricentennial New Jersey" flag, no. 200252292493 (accessed 12 Sep 2008). Size: Approx. 3 x 5 feet, made of Defiance brand cotton bunting. Obviously the logo is supposed to symbolize the tercentennial 1664-1964, but the symbolism is not clear except for the triangle: three centuries, possibly Masonic? 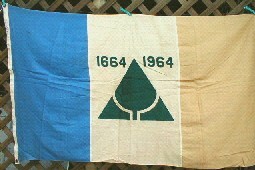 Vertically divided sky blue, white, and buff; in the middle stripe the Tercentennial logo (green triangle, point upwards, with two white lines reaching vertically up from the bottom broadening out in circular outlines) accompanied, next to the apex, by the years '1664' (left) and '1964' (right) in green. Link to an envelope showing the logo: www.zianet.com/smithson/images/f1247.jpg. with the colors as shown on the photo: Buff, light blue and medium green. with what may have been the original colors: Orange, medium blue and dark green. A special bicentennial New Jersey / US flag was offered on eBay last year by "edwinart". It showed the logo in the national colours, on a white background, as it appears on this plaque: www.pl8s.com/ps-photos-3/3794.jpg. Additional information provided (slightly edited): "Roughly 3 x 5 Feet / Made by Nyl-Glo ~ 100% Nylon bunting ~ Annin & Co ~ Verona N.J. Printed Image." 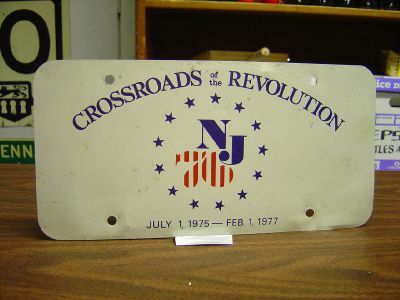 White field, in the centre combined dark blue initials "NJ" (serif, the "J" lower) at upper right and vertically red & white striped year "76" (stylized, thirteen stripes in all) at lower left, surrounded by thirteen dark blue stars, five-pointed and facing outwards.